Catherine Buttery Hollan has been researching, writing, and lecturing on American silver since the 1980s. In the late 1980s she has began working with the Museum of Early Southern Decorative Arts in Old Salem, North Carolina, on the illustrated Virginia Silversmiths, the Branching of the Trade forthcoming. In 1994 she wrote the catalog and curated the exhibition In the Neatest Most Fashionable Manner: Three Centuries of Alexandria Silver for The Lyceum in Alexandria, Virginia. She published Virginia Silversmiths~ Lives and Marks in 2010, Philadelphia Silversmiths to 1861 in 2013, Eagle Marks in 2015, and a short lookup Virginia to 1900 in 2017. She was moderator and presenter of the Silver Seminar Saturday Series at the Museum of Early American Decorative Arts in 2012 and 2014. Her current project is South Carolina silversmiths. Catherine graduated from Goucher College with a B.A. in English and math minor, and from Georgetown University with an M.S. in computational linguistics. 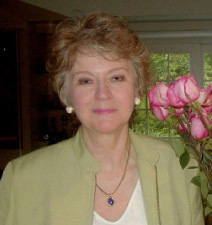 She developed computerized search tools at the U.S. Patent and Trademark Office and retired as the manager of their Public Search Rooms in 2003. Since then she has enjoyed more time to research southern silversmiths. Catherine is president of the American Silver Guild, a special interest group of collectors and curators based in the Washington, D.C. area. She lives in McLean, Virginia.